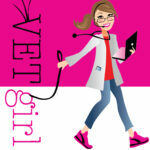 Today's VETgirl online veterinary continuing education blog is by Dr. Lisa Powell, DACVECC. She is a senior consultant for Critical Consults, LLC. In this two-part blog, she'll review the importance of fluid therapy in veterinary medicine! Emergent veterinary patients often require fluid resuscitation. Cardiovascular shock, severe dehydration, sepsis, and the systemic inflammatory response syndrome (SIRS) are examples of physiologic derangements that benefit from intravenous fluid administration. The type of fluid use, dosage, and frequency depends on the severity of clinical signs, underlying disease process, and comorbidities that may be present. Crystalloid fluids are composed of water, electrolytes, a buffer, and may include dextrose. Crystalloids are formulated as replacement, maintenance, and hypertonic. In emergent patients, replacement fluids and hypertonic saline are the crystalloids that are used. Replacement fluids are indicated in the treatment of fluid loss and cardiovascular shock. Because only 25-30% of crystalloids remain within the intravascular space after 30 minutes of administration, these fluids are ideal in the treatment of interstitial fluid depletion (i.e., with dehydration). Intravascular fluid loss can also be treated with crystalloids, although a large volume must be administered because of the interstitial redistribution. 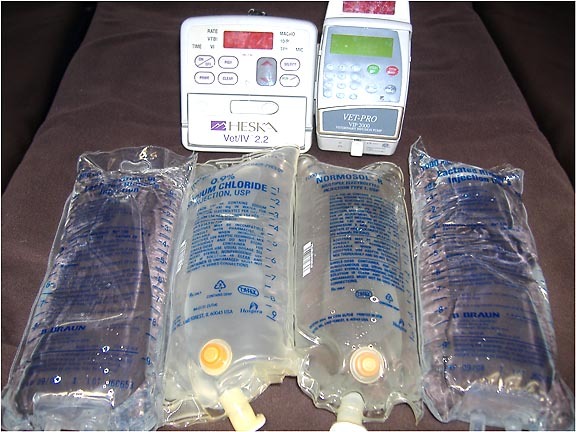 Examples of common replacement fluids include normal saline (0.9% NaCl) and Ringer’s solutions (containing lactate or acetate as buffers). Hypertonic crystalloids include solutions of sodium chloride, ranging in concentration from 7.2 – 23%. The hypertonicity of the fluid is due to the incrementally higher concentration of sodium molecules. When hypertonic solutions are administered, there is a rapid shift of fluid from the interstitial space into the intravascular space, resulting in an acute rise in intravascular volume. Because of this, hypertonic saline should never be administered in patients with severe dehydration. The primary use for hypertonic crystalloids is to achieve rapid intravascular volume expansion with a lower crystalloid dose (4 ml/kg vs. 30 + ml/kg for replacement crystalloids). The lower dose is advantageous in larger patients and in patients where large doses of crystalloids may be detrimental, such as with traumatic brain injury. Hypertonic fluids work rapidly, but have a very short duration of action. Therefore, colloid solutions are often administered in conjunction with the hypertonic fluids, prolonging their effect. Synthetic colloids, such as dextrans and hydroxyethyl starches (HES), are fluids that contain high molecular weight particles, enabling these fluids to increase plasma osmotic pressure (COP), holding fluid within the intravascular space and increasing intravascular volume. The hydroxyethyl starches (hetastarch, tetrastarch, and pentastarch) are most commonly used, as the dextrans were found to induce renal disease in humans. Hydroxyethyl starches are esterified, amylopectin-containing starch molecules that remain in the intravascular space following administration due to its high molecular weight and large number of varying sized molecules. The differences between tetrastarch, pentastarch, and hetastarch are the average molecular weight of the particles and the degree of substitution of glucose units on the starch molecule with a hydroxyethyl group. Hetastarch has the highest average molecular weight (450 kDa), with pentastarch (260 kDa) and tetrastarch (130 kDa) having lower average molecular weights. The molecular weight of the product and the degree of substitution (HES 0.5, pentastarch 0.45, tetrastarch 0.4) determines the exerted COP of the fluid and the degradation time. The higher the substitution with hydroxyethyl groups, the longer the fluid will persist in the intravascular space. Therefore, hetastarch lasts about 24 hours after administration, while pentastarch and tetrastarch last about 12 hours or less. Serum α-amylase degrades the hydroxyethyl starches, and elimination occurs through the kidneys and the reticuloendothelial system. The synthetic colloids, especially the higher molecular weight starches, have been associated with side effects, including coagulation abnormalities (inhibition of vWF and Factor VIII) and increasing the potential for volume overload. Recent studies in humans with sepsis have shown a relationship between the use of artificial colloids and an increased need for renal replacement therapy. Because of these findings, artificial colloids are now reported as contraindicated in humans with sepsis. Although coagulation abnormalities have been shown in the laboratory, no veterinary studies have proved detrimental clinical coagulation effects with the use of HES. In addition, no veterinary study has shown adverse effects on the kidneys. Alternative therapies for maintaining intravascular volume are less available in veterinary patients (e.g., albumin solutions), and because there is no published adverse affects, the use of artificial colloids continue to be used for septic patients and those in cardiovascular shock. Dogs and cats presenting to an ER with significant blood loss can benefit from the administration of blood products to replace losses. Component therapy is the most ideal, as the patient receives only the part of the blood that is needed, decreasing the chance for immune reaction and volume overload. Component products include packed red blood cells (pRBC) and plasma. Fresh frozen plasma (FFP) is plasma that is immediately separated from the red cells after collection, and has been stored frozen for less than a year. FFP contains all coagulation factors, including vWF and factors V and VIII. After 1 year of storage, the plasma is called frozen plasma (FP), as the labile factors break down, causing inactivation of vWF and factors V and VIII. Therefore, FFP should be used if the patient is being treated for diseases in which these factors are necessary (vWF deficiency, DIC, etc.). FP is often used to treat anticoagulant rodenticide toxicity, as all factors affected by the toxin are contained in FP. Fluid therapy is a mainstay of treatment for veterinary patients presenting to an emergency room with severe dehydration and cardiovascular shock. The fluid type, amount, and frequency administered depends on the underyling disease process, severity of signs, and manifestation of tissue hypoxia. Use of a fluid plan tailored to the specific patient, and with continued monitoring of response to therapy, will lead to resolution of tissue hypoxia and an improved outcome. If we are doing research on being a vet what would we look up. You can go to Vet Set Go as a website.